I probably say this about every Illustrated Faith devotional kit that gets released, but "I Am Strong" by Wilna Furstenberg is reading my mail! By that I mean the words she has so carefully and prayerfully written have been speaking straight to my heart and into my season. I should really stop being surprised by this because the Lord has used the women who write these devotionals again and again to share His heart on topics that so many of us face and that are released at just the right time. "I Am Strong" thrilled me from the first sneak peak. I've always been a fan of pink and orange (and I may or may not have had every other wall in my room painted those colors as a teenager...) and I love a bold black and white stripe. Not only are Wilna's images STUNNING as per usual, the 14 day devotional has a message that reaches far and wide, then pulls you in close. they shall walk and not faint or become tired. Isaiah 40:31 was the school verse when I was in elementary school, so you can bet I heard it over and over and over again. We repeated it at every chapel, it was printed on all of our shirts, and our mascot was even the eagle. I loved getting a chance to look at this familiar verse in a new way (AND illustrate it on the next page so I could remember the newest meaning). I am also always on the go during the summer, so I was thrilled when my kit arrived in time for me to take it to New York City. I packed the full kit in a small carrying case, much like the one that comes in the Genesis kit, and then I chose the remainder of my supplies that kept with the same color scheme. I didn't carry my journaling Bible with me on the trip because my carry-on was already full, and this gave me the opportunity to really dig in within the kit itself. I made sure to grab my Faber-Castell pens and my Illustrated Faith precision pen so I could take notes on the go. While there are a TON of supplies to choose from, keeping it simple while traveling helps me focus on the message and heart of it all rather than elaborate designs. When I first started Bible journaling, I would sketch household items into the pages, so that when I looked at my favorite candle, teacup, or blanket I would immediately remember the verse. Woven wall hangings have been super popular in recent years, and seemed like the perfect choice to go with Day 1's message and verse. I now want a hanging that looks just like that for my quiet time corner ;) I worked in a few more of the gorgeous stamps and highlighted the phrases that most stood out to me, keeping it simple but meaningful, even on the go. 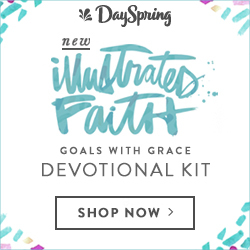 The collaboration between DaySpring, Bella Blvd, and Illustrated Faith is truly that of a dream team. 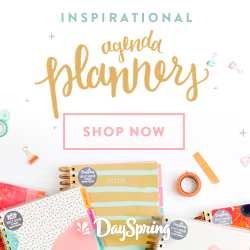 Heartfelt messages, beautiful illustrations, and quality products are sent out into the world again and again, month by month, encouraging women all over the world to walk forward in their faith with courage and creativity. Get your I Am Strong kit HERE! Don't forget to use the code THANKYOU for 25% off! *This post contains affiliate links. They won't cost you a cent more, but your purchase may help fund this future-teacher with some much needed caffeine. Enjoy!